Bible, Obad. 15, “... As thou has done, it shall be done unto thee.” America has done the worst work of deceiving other peoples and making false friendships with them. Now her turn has come. No one wants to trust her for friendship, for she has deceived many nations. Rev. Ch. 12 (Bible) prophesies of America under the worst names that could be given to a human being: serpent, snake, Satan, devil, and the deceiver of the people of the earth. Therefore, the Black man is warned in Rev. 18:4, “... Come out of her, my people...” This scripture warns the Black man to give up Babylon, which is a symbolic name, meaning America. 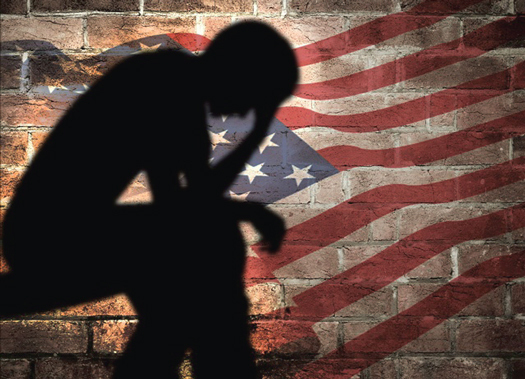 America has tormented the Black Man. Now a tormentor is after her. 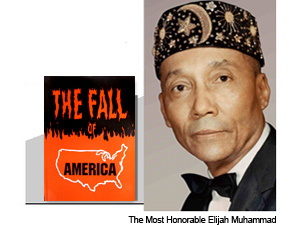 The Divine Tormentor says that we should not be partakers of the divine torment coming against America from Allah (God) Who came in the Person of Master Fard Muhammad, to Whom praises are due forever. This means, “separation.” We must separate ourselves from America so that we will be saved from the stroke of the Master Who Is God Himself. Allah (God) is whipping America with all kinds of calamities. I have been writing for many years that America must be punished for her evil done to her Black once- slaves, who are so-called free-slaves now, and who continue to suffer the same, or worse, punishment under the children of the White slave master, than their White fathers imposed upon our Black fathers under servitude-slavery. America has not only lost and is still losing friendship all over Asia and Africa, … but she is now losing friendship right here with her next-door neighbors, Central and South America. The manner—the ill-treatment and dislike with which they received the President’s Fact-Finding Committee—made it seem as though they should have been on the other side of the earth. Steps had to be taken to protect their physical self in a country which is right next-door to America. However, the scripture must be fulfilled; they shall eat America’s bread and burn her body with fire. I quote from Rev. 17:16, “And the ten horns which thou sawest upon the beast, these shall hate the whore ... and shall eat her flesh, and burn her with fire!” The ‘horns’ here are a symbolic reference to Central and South America (America’s satellites). This means that America’s gifts and what-not will be accepted, but this does not mean that America has bought their sincere friendship. They will take all the gifts which America offers, but still this does not mean that America has their heart. America is careful not to give any help to her Black once-slave for four hundred years to do something for themselves. America wants to keep her Black slave tied while she watches their movements. If we go to her asking America for a territory so that we can live to ourselves, she turns a deaf ear to us. We helped America for four hundred years, in every respect as though we were one -half owners of the country. We have gotten nothing in return but beatings, cheatings and shootings down on the highway. If we think that there is a God of Mercy (and there is One)...should we not think that He will sympathize with the poor Black slave to receive justice from his master? The Black slave helped to make America rich. Would Allah, (God) be silent forever? Being the God of Righteousness and Justice, would He not take to Himself the work of aiding the poor Black people against their evil oppressors? America wants everyone to help her bemoan all of her set-backs; but when she causes others to fall...breaks up the countries of other peoples and destroys their independence and freedom, she laughs and prides herself as doing a great thing. She puts her feet upon their economic neck and destroys their independence as a nation. All this now returns to America. The little nations are now awake. They had looked for true friendship from America but instead America deceived them. Why? Because you, America, have been and are an aide of the destruction and fall of other peoples. So who should help you in the day of your fall? This is what Allah (God) wants to bring home to America through His prophets. The Holy Qur’an refers to America in this kind of prophecy: “When her doom comes there will come one calamity after another.” As soon as she thinks she is getting over the sore made by a previous calamity, another will attack her. America is undergoing all that is prophesied against her. It is nothing new. It is well -known. We have been eating the bread of affliction and suffering the poisonous bites of our White slave master. It has caused actual death of our proper mental way of thinking. The natural brain of the Black slave is poisoned and cannot think for itself. So Allah (God) is asking us to separate from White America. But the mentally dead do not want to go from her for they have not yet gotten the knowledge of truth of our God, Allah and His Mercy for them. The Black slave children are victimized by the White slavemaster, because of the condition the White slave-master brought our Black slave-fathers up in. They do not readily hear the right answer to the problem. Regardless, to how I cry in their midst, they are poisoned and mentally dead.